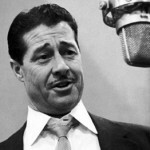 At the apex of his long and varied career, American actor Don Ameche (b. Kenosha, WI, 31 May 1908; d. Scottsdale, AZ, 6 December 1993) was known primarily for his work in radio. Nonetheless, he had what amounted to two major careers in the movies, first as a romantic lead, then as a character actor, winning an Academy Award at the age of seventy-eight, and substantial success in musicals on Broadway. Dominic Felix Amici was one of seven children. His mother was of Irish and German descent, his father an Italian immigrant; both parents were from similarly large and close Midwestern families. He went to Marquette University, Loras College, and the University of Wisconsin intending to study law, but discovered his natural gift for acting while participating in student theatricals. After his first professional job – filling in at the last minute for a missing actor in a stock company – he gave up law entirely. He worked briefly in vaudeville, touring for a year with the notorious Texas Guinan, but his bland wholesomeness and affability did not fit well with her in-your-face outrageousness (“Hello, suckers!”) and she fired him. Capitalizing on his rich baritone voice, Ameche spent five years as a radio announcer. In 1933, ambitious for a film career, he moved to Hollywood, but MGM rejected his screen test. He struggled for a time until he landed a small part in Clive of India (1935) with Ronald Colman and Loretta Young. This performance earned him a seven-year contract with 20th-Century Fox, and in a very few years Don Ameche was established as Hollywood’s ideal light romantic lead (Alexander’s Ragtime Band, 1938). In the fifteen years between Clive of India and Slightly French (1949), Ameche made over forty films, including Heaven Can Wait (1943) with Gene Tierney, Wing and a Prayer (1944) with Dana Andrews and Sir Cedric Hardwicke, and It’s in the Bag (1945), in which Don Ameche played himself. But with the 1950s his movie career came to a halt. He had reached an even larger audience with his return to radio in 1946, playing with Frances Langford in a comedy series by Philip Rapp called The Bickersons. Enormously popular, the series featured a warring married couple hurling witty if cruel insults at one another; it moved from NBC to CBS after a year and lasted until 1951, then spun off The Frances Langford-Don Ameche Show and three long-playing records. Ameche’s voice was a familiar favorite on many other programs as well, including The Edgar Bergen and Charlie McCarthy Show, The Empire Builders, The First Nighter Program, Family Theater, and the soap opera Betty and Bob. 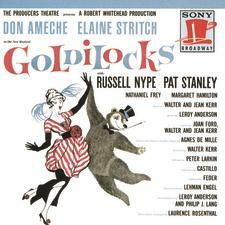 Simultaneously, Ameche was enjoying a significant career on the Broadway stage, mostly in musicals: Silk Stockings (1955), Holiday for Lovers (1957), Goldilocks (1958), 13 Daughters (1961, a flop), Henry, Sweet Henry (1967), and Our Town (1989). He was frequently seen on television in the 1960s, as a host for International Showtime on NBC, and as a guest star in Jack Palance’s circus drama, The Greatest Show on Earth (ABC, 1963–1964). In the late 1960s and early ’70s he directed the NBCTV sitcom Julia, starring Diahann Carroll. Except for two 1970 film comedies, The Boatniks and Suppose They Gave a War and Nobody Came?, Ameche was virtually absent from the silver screen until 1983, when he succeeded in making a genuine Hollywood comeback. With fellow veteran Ralph Bellamy in Trading Places, he played one of two rich brothers who engineer a scheme to reverse the lives of two younger men (Dan Aykroyd, Eddie Murphy). Ameche’s next role, as a retirement-home Casanova in Cocoon (1985), won him an Academy Award for Best Supporting Actor. Thereafter, he appeared to even greater acclaim in Things Change (1988) by David Mamet and Shel Silverstein, in Cocoon: The Return (1990), Oscar (1991), and Homeward Bound: The Incredible Journey (1993). His last film, Corrina, Corrina (released 1994), was finished just days before his death. Don Ameche was married to Honore Prendergast for 54 years before her death in 1986. They had six children. There are two stars on the Hollywood Walk of Fame in his memory, one for his work in radio and the other for television.